Style. Some men are just born with it. Whether fashion runs in your blood or you’re more the see-and-then-do kind of gent, here are the 10 best Instagram accounts for classic men’s style inspiration right now. Matthew Zorpas founded online platform The Gentleman Blogger in 2012, and has since grown into a global brand. The Cypriot London-based creative, with a penchant for travel and super-luxury brands, has amassed an 186k Instgram following for his well-rounded style file that’s full of global urban hopping. Got a trip coming up and want city-style specifics? Zorpas is your fashion man to follow. For Brandon Chau, co-founder of Attire House—Hong Kong's luxury menswear mecca—life is meant to be lived, and lavishly so. 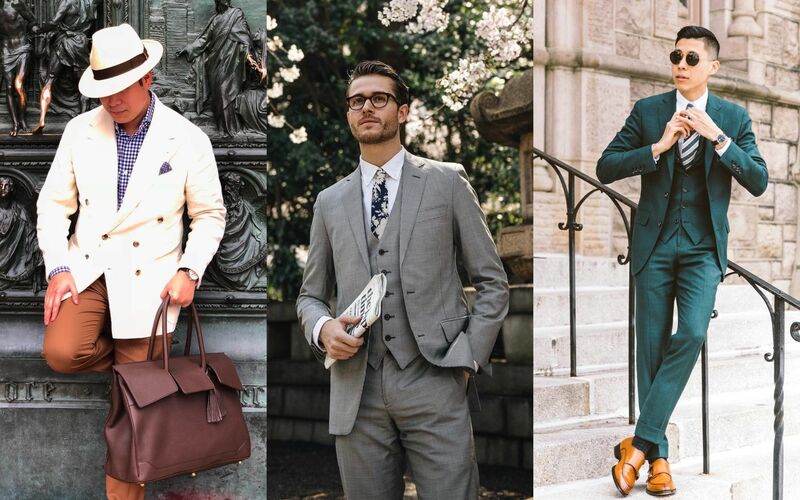 The self-described style devotee delivers an Instagram feed of sharp suits, slick hair and unrivalled shoes, all the while whisking his followers away to exotic places like Milan and the coasts of Italy. His taste travels beyond the wardrobe too, seen sporting a cigar and single-malt in hand. Quintessential style child of Los Angeles and New York, California-born, Manhattan-based Adam Gallagher coolly blends the breeziness of the west coast with the slickness of the east. And he travels, a lot. A penchant for louche tailoring, cool casual shirting and some of the best loungewear to hit Instagram, he nails on- and off-duty looks whatever city he ends up in. The founder of online platform He Spoke Style, this musician and ex-professional cyclist is one of the most well-rounded gents in the blogging game. The Manhattan-ite is all about bespoke and is a lesson in power dressing, via sharp suits and rakish accessories. He’s one for a whisky and a cigar too. Cause style is a lifestyle, really. If you're a Hong Kong local, you'll know The Armoury. And the boutique's co-founder, Alan See, is equally as savvy when it comes to bespoke style. Dressing to impress on any given day, See's Instragram shows the stitch and thread of custom tailoring, as well as flawless ways to wear luxury: watches, shoes and suits. Oh, and the odd Rolex too. American visual manager Brian Chan should be coined the ‘purveyor of layers’. The Philadelphian’s 62.6k-strong ‘gram is a montage of mixed up weather patterns and seasons, and his mastery of putting an outfit together—rain, hail or shine—will have you style-inspired. Getting married soon? Chan just did too. Check out his groom’s suit. One of the most street snapped men during Milan fashion week, Mariano di Vaio is Italian fashion royalty. Some 6 million Instagram followers would agree so, woo-ed by his sprezzatura suits, impeccable shirting and Italian-made leather shoes. Di Vaio’s a new dad, an avid gym goer, and grooming guru too. He has the best skin and hair in the business. Australian menswear veteran Steven Calder saw a niche in the local fashion market after travelling the globe for work and started his own namesake made-to-measure and ready-to-ready boutique in Melbourne. The handsome chap (with moustache to boot) is also his shop’s official muse; modelling his Neapolitan suits and Marlon Brando-esque tee-and-trouser looks in cities such as Naples and Sydney and Bali too. With an Instagram handle hailing him Osaka’s Gatsby, Nishi lives up the self-appointed title. Representing a slightly older generation of men’s style leaders, Nishi’s feed is mostly tailored suits, both three-pieces and double-breasted ones, with pops of casual looks featuring classic jackets that rival the great Steve McQueen. Oh, and the Great Gatsby too. A real-life ‘silver fox’, Eric Rutherford is exactly how you want to look when you’re going grey. The 50-something former actor, event planner and now, model, uses his salt-and-pepper hair and groomed good looks to propel his innate fashion sense on Instagram; something acquired after living in New York and rubbing shoulders with the best-dressed at any given event.